For take out and delivery, please call 406-655-0888.
chili peppers, white and green onions. 4 piece lamb chop, grilled with black pepper. *Consuming raw or undercooked meats, seafood, poultry, shellfish or eggs may increase your risk of food born illness, especially if you have certain medical conditions. Before placing your order, please inform your server if a person in your party has a food allergy. 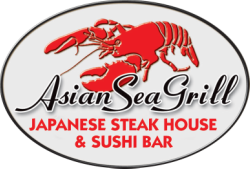 Asian Sea Grill & Sushi Bar - Dine-in, Take-out, and Delivery are available.